Earlier this year I was invited to participate in a fun opportunity to get published and help people learn about the editing process - how could I pass something like that up? So I didn't. 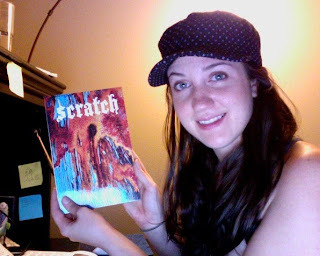 The result is the "wild card entry" in Volume 2 of Scratch, which is a publication of the 2010 contest's winning short stories. My short story, "Sawyer's Nest", is the last one in the book, so it's very easy to find. :) If you're interested, Scratch is on sale for $15 at this link. There's some really great writing in there, besides mine. So you are an actor and a writer and a chef. Congratulations! Tease us with an excerpt or synopsis! Hey Lira. I recognize you. A while back this blog turned me on to your struggling actress link which is pretty cool. Now I see the connection between you and Ireni, both up and coming actors and writers. Awesome. Thank you. :) It's a short story, so a synopsis seems a little silly (not to mention it would ruin the ending). However, I will say this. It's a lovely, mysterious, magic realism piece based on actual events in my childhood in North Carolina. Whetted anyone's interest? Congrats! That's awesome Danielle. You rock! And thanks everyone for the congrats! Add my congratulations to the list! This is so awesome! I'll order one for me and your Gram. :) Every little bit helps.